OBE JP LL.M(Hons) M.ComLaw Barry is a former MP who has a lengthy background in energy policy - ranging from being the National Minister who introduced "carless days", to Petrocorp director, and chairing the Gas Council, Power NZ, ESANZ, and EMCO. In economic terms, New Zealand’s isolation has long been seen as a major handicap. But in terms of ‘climate change’ alarm, isolation is proving to be its greatest asset. Surrounded by oceans – which make up 71% of the earth’s surface – “God’s own” is well insulated from the landmasses and population centres where dangerous anthropogenic global warming (AGW) is said to be generated. In its Climate Change Projections, the Ministry for the Environment reports the 2100 AD outcomes of downscaling IPCC climate models to just the New Zealand grid-box. It finds that the 34-model average ratio to global temperature change is -1.32, meaning that New Zealand can expect to warm up 33% less than the global average. However, it says the range is from a low of – 0.77 to a high of – 2.05. (p71, chap 3.4), so our future warming might be 100% less than the global average. The model figures are just guesses, of course. If the average worldwide warming of the last 40 years has been about 0.4°C, then some countries have warmed, some have cooled and some have stayed the same. A recent research paper based on actual observations and published in the prestigious journal Nature tells us that New Zealand falls into the cooling category. This 2017 study entitled “Regional cooling caused recent New Zealand glacier advances in a period of global warming” was a collaborative effort undertaken by three scientists from Victoria University’s Antarctic Research Centre, two scientists from NIWA and Professor James Renwick (the NZ media’s go-to man for climate alarm). The researchers found that at least 58 New Zealand glaciers have been advancing during the past quarter-century, while thousands of glaciers throughout the rest of the world have been retreating. The World Glacier Monitoring Service database shows that, in 2005, “15 of the 26 advancing glaciers observed worldwide were in New Zealand”. More than half ! The abstract of the paper notes that the global loss of glacier mass “is predominantly a response to anthropogenic climate warming”. And the exceptional glacier advance phase in New Zealand resulted predominantly from discrete periods of climate cooling. “The lower temperatures were associated with anomalous southerly winds and low sea surface temperature in the Tasman Sea region.” The “Regional Cooling” in the title of the paper refers to the whole of New Zealand and its surrounding seas. So, what does the actual temperature data say? The national temperature record takes the form of a ‘Seven-station Series’ (7SS), based on the monthly means at seven geographically-representative weather stations. All the relevant daily temperature data is publicly available at NIWA’s ‘Climate Database’. 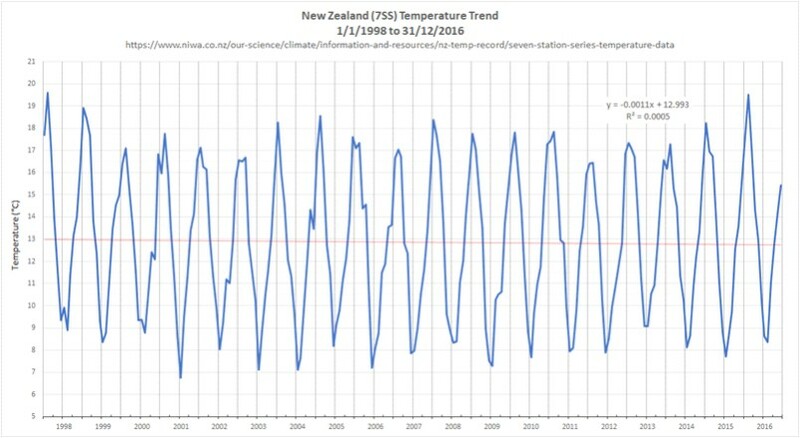 The Climate Conversation blog wondered whether New Zealand had experienced the same AGW “hiatus” since 1998 as the IPCC discusses in its 5th Assessment Report. So they downloaded the NIWA data and were not too surprised to find that the 1998-2016 temperature trend is in fact a (trivial) cooling. The graph and trend line can be seen below. Temperature stability in New Zealand is not just a recent phenomenon. The Alexander Turnbull library has the original of a research report by the Dominion Meteorologist in 1868 which finds the New Zealand average temperature over the preceding 8 years to be 13.1°C – slightly higher than today. This historic view further aligns with De Freitas et al (2014) which is the only relevant science that appears in the international peer-reviewed literature. That study shows that the average 7SS temperature trend has been only 0.28°C ± 0.3°C since 2009. As the error bars exceed the trend, the range of temperature changes include zero – ie there has been no detectable warming in this country for over a hundred years. So, New Zealand hasn’t yet experienced even the slightest twinge of “climate change” (as defined by the UN), despite the noisy alarm fostered by groups such as the Green Party and the Royal Society. So why is the Government spending millions of dollars in research grants to study the effect of alleged New Zealand warming on dozens of different plants, insects, coastlines, etc? Will global warming eventually reach our shores? Or will we remain immune? Nobody knows – but it has been well said that past experience is the best (only?) indicator of future events. “The [Complaints] Committee does not agree that the idea that climate change is happening in New Zealand is either controversial or “not true”. “It is not inaccurate to state climate change is increasing the number and intensity of extreme weather events (in New Zealand). The Committee does not agree that the overall discussion was a controversial issue. I have now, of course, referred the complaint to the Broadcasting Standards Authority. It will fall to this Government body to decide whether the Government-owned broadcaster’s wrong-headed groupthink is acceptable – you can see the details HERE.